How Much do Different Countertop Surfaces Cost? Starting a kitchen remodel? New construction? Need to select a countertop surface but don’t know what’s in your budget? Use our professional countertop estimation guide! Complete a preliminary measurement of your solid surface and stone countertops and obtain an estimate of your project. As with any estimation, all the necessary information must be present to begin. For countertop estimation, you will need a detailed diagram (plan view) of the entire job. This diagram does not need to be to scale. On our first example, we will use the industry standard 1 ¾” overhangs past the cabinet front, or ¾” past the door/drawer front on all of the ‘exposed edges’. Exposed edges are edges that do not adjoin a wall, generally overhang cabinet doors and drawers, or are at the end of a countertop run where there is no wall or appliance. With this example, we will also include a 12” overhang on the bottom 72” run. The overhang will extend down away from the kitchen and represent a bar seating area. Here is a diagram (plan view) of our first job. In it you can see where each cabinet is located, the overall length of the cabinets and their widths, that there are 2 walls, and where the cooktop, sink, refrigerator, and dishwasher will be located. 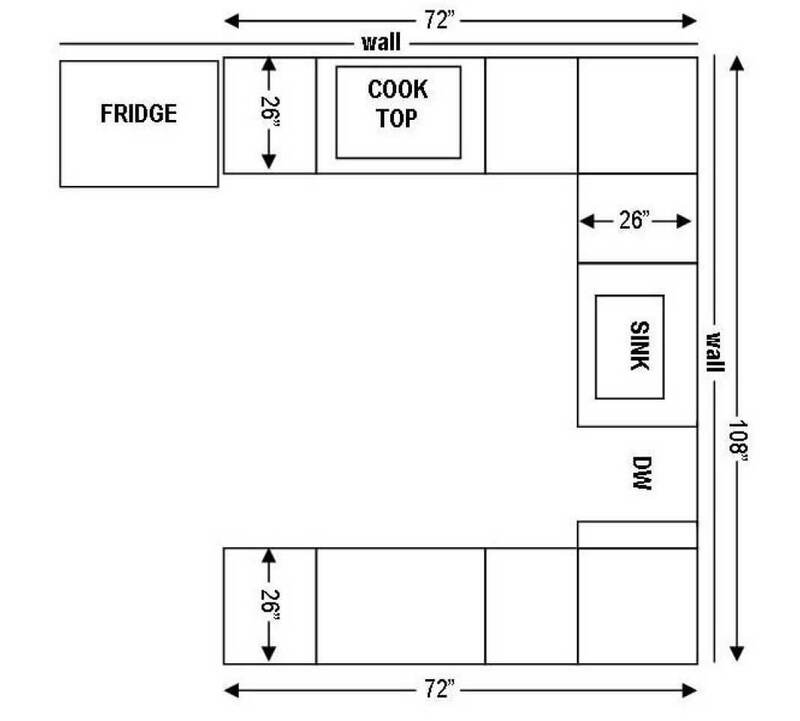 This diagram shows all cabinet base placements in the kitchen along with where the cook top and sink will be placed. The fridge and dishwasher are also included in the diagram. It is useful to make notes on your diagram as you go along. You decide which notes to write. We’ve found that it helps to shade in and number each countertop, mark radius corners, show walls, mark edges to be polished and mark where seams are to be located. This will help you keep organized and increase the precision and accuracy of your estimates. It is important before calculating the countertops square footage to determine where and how many seams will be needed.  You should explain to your customer that the seam locations done by you are only a guide for estimation purposes. Based on his experience, the company’s measure-man will determine the best place for seams and confirm the seam locations with the customer. Seams are normally located in all corners to minimize waste/cost, and to make the pieces more manageable. Seams are also important because they act as pressure relief joints that allow possible shifting of the countertops due to expansion and contraction, as well as movement of the home’s frame. The seams allow the movement and “pop out” being able to be repaired afterward, instead of having a crack on the top because there was no way to relief the movement. Seams are NOT recommended through the sink or cooktop cutouts. While it would be the smallest seam possible, it is the weakest place for it. A typical granite slab is 9′ x 5′. This dimension limits the length of a countertop without putting in a seam. Therefore, it is not recommended to make countertops longer than 100” without a seam, or without checking with the fabricator for exact slab sizes. You also need to consider where the cook top, sinks, and dishwasher are located. Seams should not be placed over dishwashers. There is also an esthetic aspect when it comes to placing seams. In our sample, the bottom 72” run is not along a wall. This means that both sides are open (typically called a peninsula). Although we could put a seam in this 72” run, aesthetically it will look better without a seam, so we placed the seam on the 108” run instead. Here we have the marked seam placement with blue hashes. This seam placement divides our job into three, rectangular pieces. “L” x “W” / 144 = s.f. (Length times width divided by 144 = square feet). Kitchen base cabinets are generally 24″ in depth. This is the case in our sample diagram. To that dimension (24”) you need to add the 1 ¾” overhang on the exposed edges. This will increase the depth of the top from 24” to 25 ¾”. To make math simple, we normally round up to 26”. Piece #1 –This piece only has one overhang to consider. The other 3 sides are bound by a refrigerator, and 2 walls. 72” x 26” / 144 = 13 s.f. Piece #2 –To this 108” run, we need to minus the 2 (26”) corners that will be covered by the 72” runs. (108”- 26” – 26” = 56”) 56” x 26” / 144 = 10.11 s.f. Piece #3 – This piece is only touching 1 wall and is open on all other 3 sides. On 2 sides (inside and left) there will be a 1 ¾” overhang. On the 3rd side (outside) we will add 12” to create a snack bar overhang. That will make the length 74” and the width 38”. 74” x 38” / 144 = 19.52 s.f. 13 s.f. + 10.11 s.f. + 19.52 = 43.63 s.f. Backsplashes help transition the counter top to the wall and provide protection from spills getting behind the counters and onto walls. Backsplashes are generally marked by drawing dotted lines on your diagram where the backsplashes are to go. It is helpful to number the backsplashes. Backsplashes can vary in height so it is important to confirm the final dimensions with the customer based on the look they want to achieve. For our example, we will assume the customer wants the standard 4″ backsplash look. Backsplashes tend to be fragile when fabricating and transporting due to their narrowness. For this reason, they are restricted to 80” in length. The measure-man will determine the best placement for seams and confirm the seam locations with the customer. You can make the splash as long or short as you need for your calculations. Backsplash placement is usually done in areas where the countertops meet walls, but you should always confirm with the customer where they would like backsplashes. For our example, the backsplashes will only run the length of the countertops adjacent to walls. Thus, there will be backsplashes along the 74″ cooktop countertop and along the 108″ sink run. Let’s now figure this square footage. 120” x 4” / 144 = 3.33 s.f. Full-Height Splashes: As mentioned, here we calculated for 4-inch splashes. If your job calls for full-height splashes assume 18 inches as your height, unless you have more information present. To calculate the total job square footage you need to add the total countertop and backsplash square footage. 43.63 s.f. (counter tops) + 5.33 s.f. (backsplashes) = 48.96 s.f. For our example, we will use $45 per square foot as our price for basic measure, fabrication, and installation. You will have to refer to your material price list to find the material cost when you are working with a customer. By multiplying the square footage by the material cost per square foot you will estimate the basic cost for the job. This cost will normally cover basic measure, fabrication (flat-polish edgework and one cutout for an over-mount sink) and installation charges. All other options to customize your countertops (edgework, cutouts for under mounted sinks, radius corners, etc.) will incur into extra charges. As with most jobs in our example, we will assume that all exposed edges will have an edge treatment. Most S.F. prices will have basic prices will have ‘flat polish’ included. In this case, we will change the edgework and treat these countertops to a Half Bullnose / Waterfall Edge treatment. To help you remember what edges are to be polished, mark them with an “X” as seen in the next diagram. To calculate the edgework necessary you need to know the lineal footage. Mostly likely these dimensions will not be written on the diagram so you will have to figure them out. So how do we do that? Let’s start at the top with piece #1, and work our way around it. To begin let’s remember that cabinets are 24” deep plus the 2” overhang. This first edge to be polished (26” depth) sits next to the Refrigerator, it needs to be flat-polished and the basic cost of the s.f. will cover this cost. Next, we know the countertop is 72” long, however, the edgework stops at the seam so we can minus 26” (cabinet width plus overhang) from 72” and we get the first dimension needed to calculate the Half Bullnose edgework 46”. Piece #3 came in at 74” x 38” back in Step 3. We can now start adding the lineal inches to get the total lineal foot of edgework for the job. Now, net together all of the totals (material, edgework, and miscellaneous costs) to find the total estimate. In some cases, the customer may prefer that a seam be placed in a certain spot or no seam at all. In all of these cases the final shape of the piece will not be rectangular, but more likely L-shaped. With any L-shaped piece there will be most likely “waste material” involved. Waste material is any material that is not part of the final piece but was cut away and discarded to achieve the L-shape or any shape that is not rectangular. Waste material is included in the material cost, but not in the edgework or miscellaneous costs. Let’s use an L-shaped piece to demonstrate. As for the edgework, calculate the linear edge as we did in our first example. If you do not have the actual dimensions of the finished piece minus the waste, use the perimeter of the waste area as your measurement. Finally, multiply by material cost. We’ll stick with our example assumption of $ 27.00 per foot for a DuPont edge. Make sure you consult the most current edgework price list when working with your customer. Again, your diagram may give linear edge dimensions or you may be able to obtain them through the customer. If so, use these given figures to calculate a total edgework length and cost. If not, simply do as we did here, and use the perimeter of the waste area as your estimated edgework length. This estimation will work for any size piece as long as you remember to use the longest width and the longest length. As you can see in the next example the piece is not L-shaped, but still fits into the 80”x40” category. Therefore, the material costs would be the same. Without knowing the length of each side you would also figure the lineal footage the same. You may also need to figure waste material involved in radius pieces. Follow the same steps for material. In the diagram below the piece is 26” in diameter. That means that the length and width of this piece of granite need to be 26”. 26” x 26” = 676 / 144 = 4.69 s.f. (roundup) = 5 s.f. 81.64 lineal inches / 12 = 6.83 lineal feet (roundup) = 7 l.f. Using the actual measurements is much more accurate. You may get some kitchen layouts lacking any figures at all. However, if these kitchens are drawn to scale, you will still be able to give a fairly accurate estimate. If they are not drawn to scale, then it will be next to impossible to give any accurate estimate to the customer. Notice that the first number always refers to the length of the drawing on the paper and the second number refers to the length of real-life objects. For layouts drawn to scale, an architectural ruler with a built-in scale will be helpful. An architectural ruler has 11 separate scales on it and will help to speed the process up of determining the lengths you need to measure. If you are having trouble finding and figuring the scale, it is helpful to remember that standard cabinet depth is 24 inches. Thus, you can use this to figure the scale. For example, if the cabinets are 1⁄2 inch deep on your diagram you know you are using a 1/4 scale. As no two kitchens are the same (unless you’re doing a motel or condo project) each estimate will be a new and exciting project for you. If you understand and keep these basic rules in mind, take your time, and make sure you have all the information, you should be equipped to tackle any estimation.